We’re going to be shooting pretty much the entire movie outside. 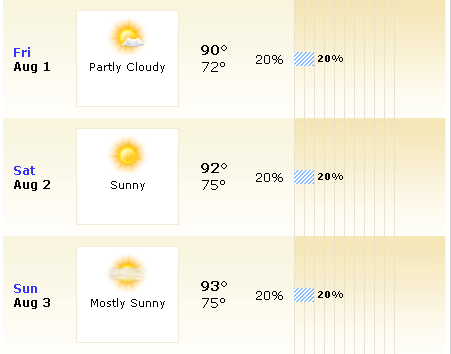 I would prefer the weather be in the high 70’s to low 80’s, but at least the forecast doesn’t currently predict rain. I’m sure you can afford some fans and air conditioned trailers for the Hollywood cash bankrolling your flick, right? I’m bringing a big umbrella. And coolers filled with beverages. Don’t bring that third thing. You’re just asking for trouble.